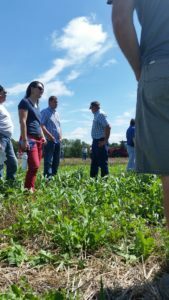 This program GUIDES producers through the intensive management changes that come with switching from a conventional to a soil health focused conservation cropping system (cover crops, reduced tillage, improved nutrient management). Utilizing Soil Health Specialists to develop a 5-year Transition plan and provide continuing one-on-one technical advice from cover crop selection to planting and termination. The Specialists help the farmer with other production management decisions needed to successfully adopt a more sustainable system, including enrollment in the Soil Health Partnership’s Tier 2 research program that tracks soil quality changes through the transition period. Farmers in the 5-year Transition Program begin with cover crops on a 40-acre field in year one, with a goal of sustained system change at the whole farm level by the end of year five. Cost share and technical support is phased out as the farmer finds success and gains confidence. A localized, peer-to-peer network of program participants and interested neighbors sharing results and experiences serves as the amplifying mechanism to influence changes at a broader scale. Participating farmers will also be encouraged to enroll in ISAP’s complimentary programs - the 5 Star Farmer Certification Program and Precision Conservation Management.